Part I of this review covers the details (Why, When, Where, How Much? etc.) 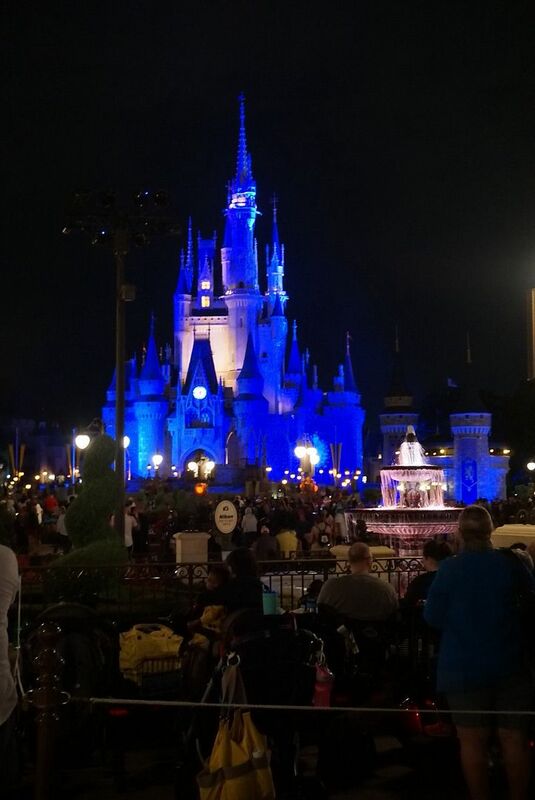 of this Special Dining Event held at Magic Kingdom. 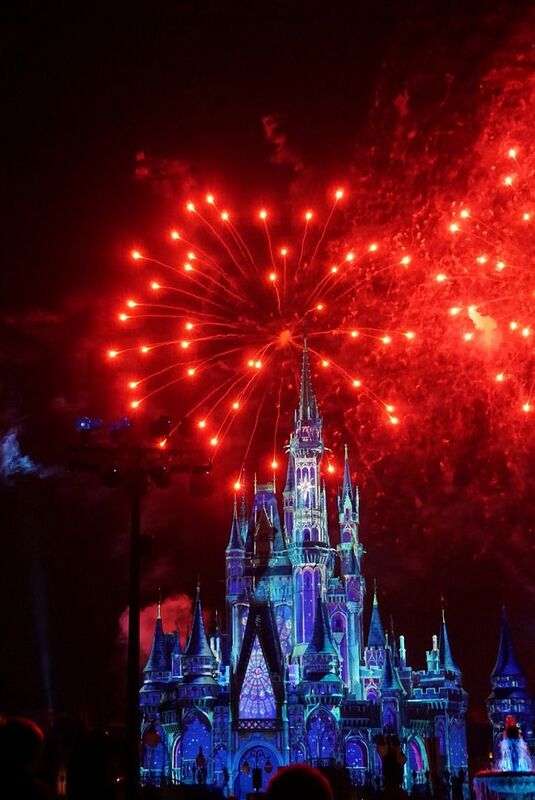 It also includes photos of the Happily Ever After Fireworks show, as seen from the Plaza Garden area that is reserved for party guests. Check out Part II for my review of the actual dessert party, including photos of all of the food and beverages offered. 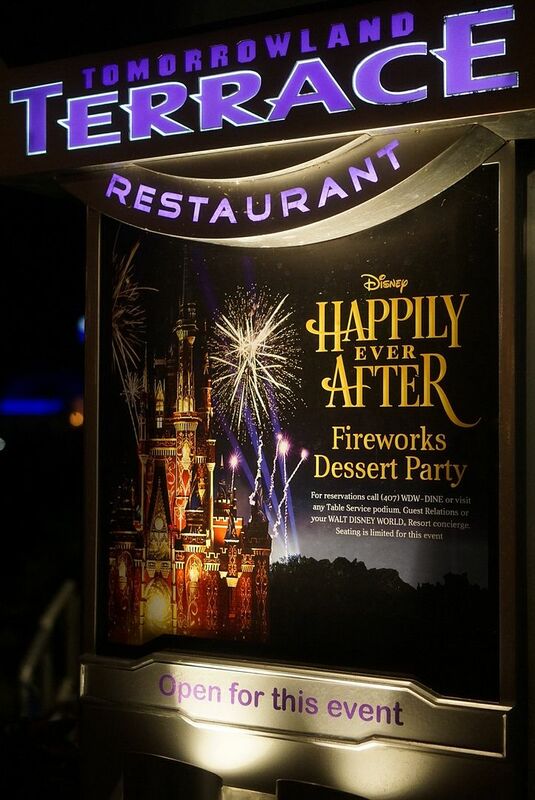 During my last trip in the fall of 2017 there were just two Happily Ever After Fireworks Dessert Party options to choose from. The first of these was the more expensive option (at $79 per person, including tax) which included reserved table seating on the terrace of the Tommorrowland Terrace area. From your preassigned reserved table you would partake of your chosen desserts and then remain there to watch the Happily Ever After show. 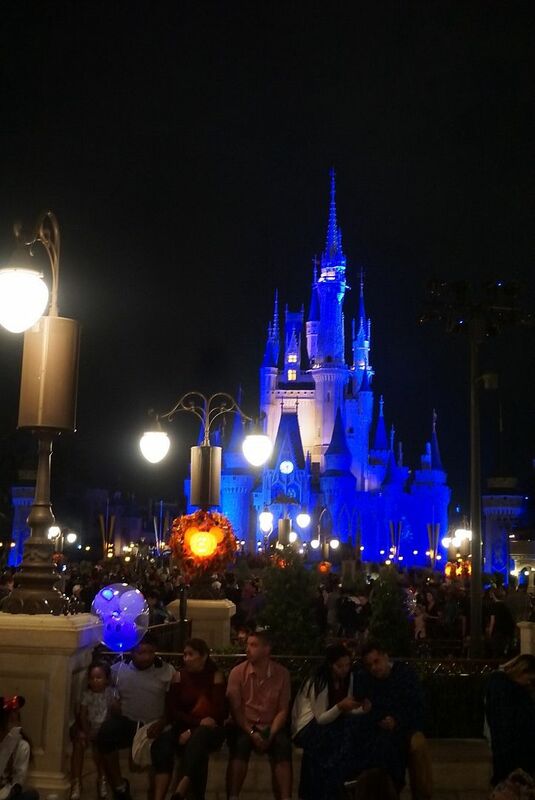 While this area does overlook the hub, it is more of a side view of the castle which is somewhat obstructed by trees (as you can see in the above photo I found on the internet). I though chose the other option (which was less expensive, at $59 per person) and forego the reserved table seating during the fireworks. Instead I stood for the fireworks show in the reserved (for party guests) area known as the Plaza Garden. 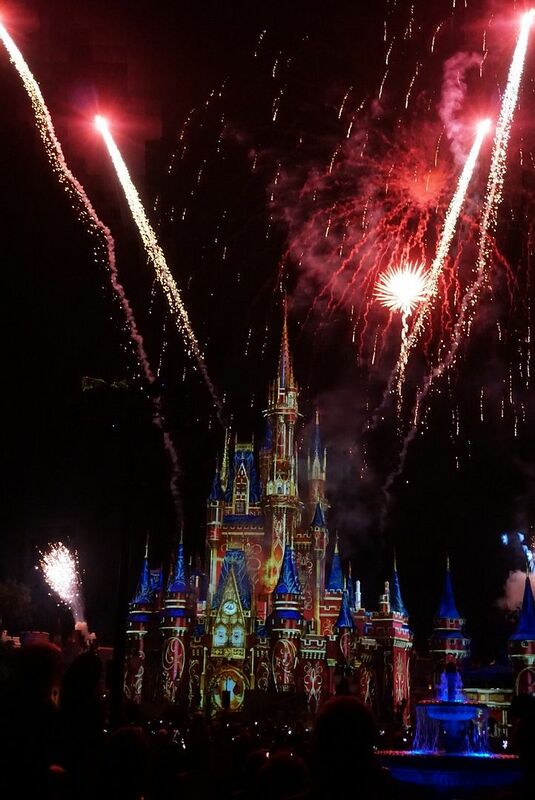 This provided me with a better, straight-on view of the fireworks and (more importantly) the projections on Cinderella’s Castle, which is a big part of the Happily Ever After show. If you read my review of the party I attended in November 2017, you know that I thought that overall this experience was worth the $59 that I paid. So fast forward almost one year to the planning for my fall 2018 trip. Since I had done both this dessert party and the Star Wars one held at DHS on my last trip, I decided that I wanted to try the one at Epcot for Illuminations (called Frozen Ever After Dessert Party). However, for some reason it was only being offered on a few nights of my 10 day trip and those nights were all unavailable when I tried (many times) to reserve this online. 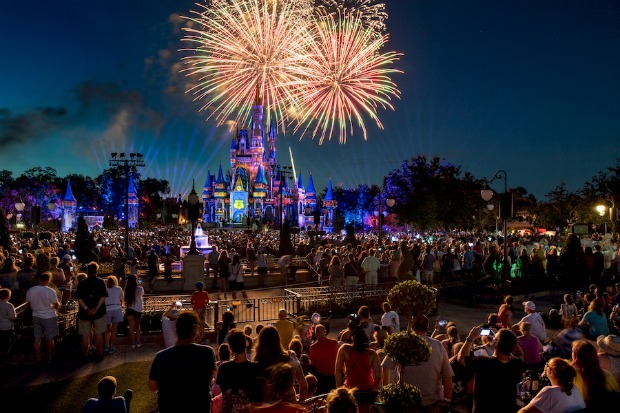 So I began looking at other options, which is when I discovered that there had been a few changes made to the Magic Kingdom Fireworks Dessert Party in May 2018. The first change was not a good one, in that the prices had gone up. 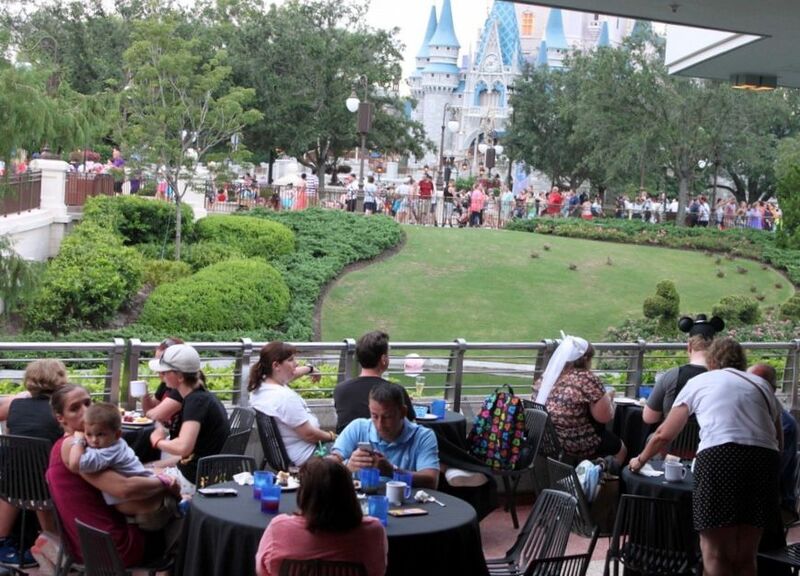 Now the reserved table seating option was $84 (a $5 price increase) and the Plaza Garden viewing option was $69 ($10 more than I paid in 2017). In reading some party reviews from after the price increase, I noticed that they had added a few savory food options to the dessert buffet plus one of my favorite Magic Kingdom desserts (more on that later) so I thought these additions perhaps warranted the added expense. 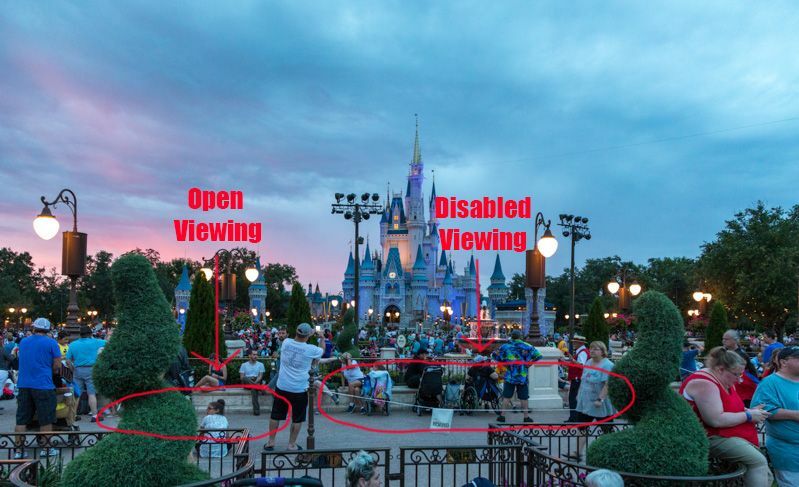 However, the biggest change was that they added a third option where (for the same $69 price) you could attend the dessert party after viewing the Happily Ever After show from the reserved Plaza Garden area. This option interested me because I thought I would have more time to take photos (for my blog review) and enjoy my food if I waited and attended the party after the show. With attending prior to the show I did feel a little rushed, as I wanted to get out to the Plaza Garden to find a good viewing spot. Though this is prepaid at the time of booking, you can cancel the reservation up until 5 days in advance of the party date and receive a full refund. Also, last year I had prepaid for this and on the day of the party I was not feeling well plus they were expecting inclement weather that evening. 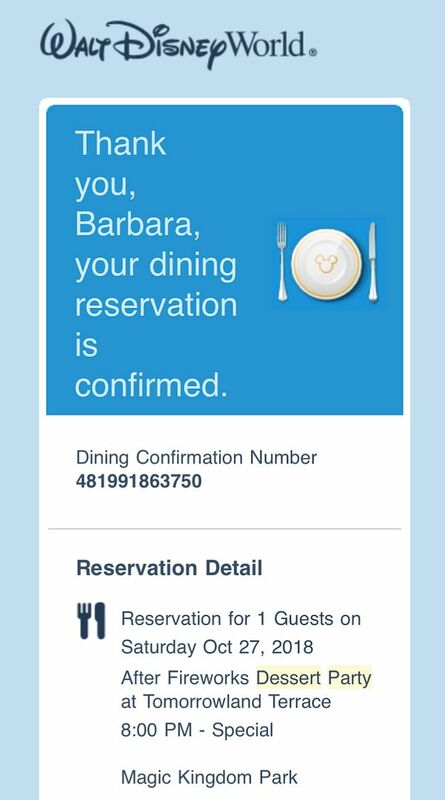 So before leaving Magic Kingdom that morning I stopped by Guest Services and they kindly postponed my reservation and rescheduled it to another evening, later in my trip (at no additional charge). On the night of the event, I got in line at the check-in desk (located just outside the entrance to Tomorrowland Terrace) at around 7:30, which was a half hour earlier than the 8:00 recommended time on my reservation. 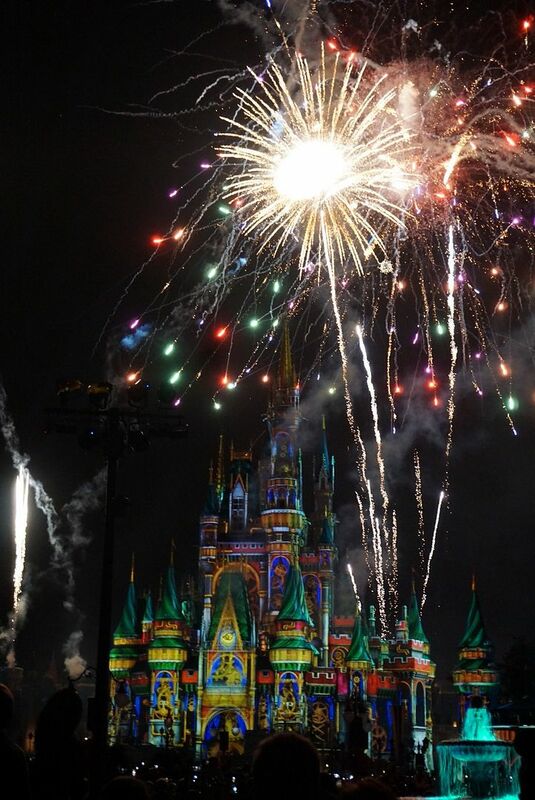 Happily Ever After was scheduled for 9:00 that evening. There was a second desk and line for guests who had reservations for the other two party options. Their recommended check-in time was 7:30 so that line was already moving, with guests being checked in and then being immediately seated for the first dessert party. They had castmembers walking along our line to make sure there was no one there who actually should be in the 7:30 line. At around 7:45 they then started checking in guests from my line. Since there were only a few parties ahead of me and the line moved quickly, I was checked in, wristbanded (identifying me as a second party guest), led by a castmember to the Plaza Garden viewing area, and taking photos from my chosen spot before 8:00. And speaking of my chosen spot, I got a prime spot that was in the front and center of this area. This was a better location than what I got last year, as by the time I entered the Plaza Garden those front spots were all taken by other guests. There was a walkway directly in front of me, the reserved viewing area for disabled guests to the right, and then the area to left was open to all park guests. Again my spot was right up against that center gate. For awhile there were people sitting and/or standing along the walkway that was in front of the Plaza Garden, however castmembers started patrolling the walkway soon after I took the above photo. They did a great job of keeping guests moving along and out of the walkway, directing them to open viewing locations. Note: The area on the other side of the rope is the handicapped section. One advantage of being in the reserved area vs. outside in the “free” viewing areas is that I had the room to sit during my hour long wait before the show began. The surrounding outside areas looked pretty crowded so I probably would have had to “stand my ground” to keep an equally good spot or risk being trampled. 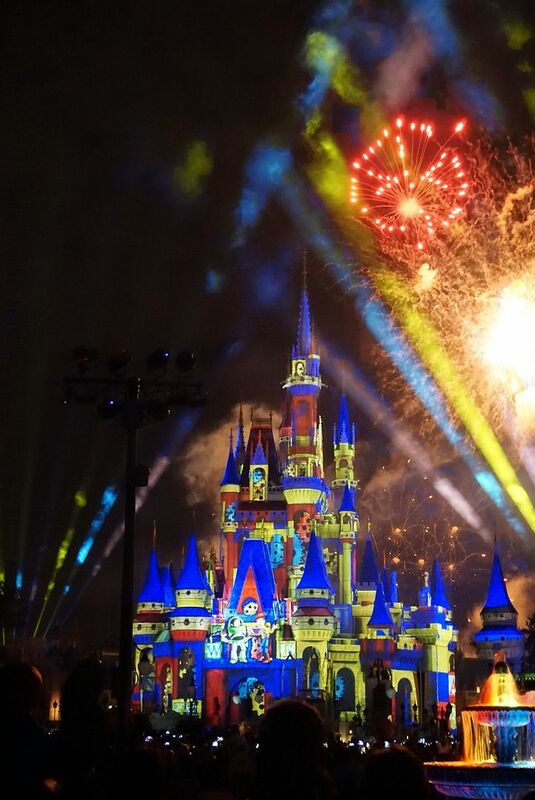 I must admit that before seeing the new Happily Ever After show last year I was a bit skeptical. I was a huge fan of its predecessor, Wishes, and had so very many fond memories of seeing it with family and friends. Though I saw Wishes many times, it never got old. Hence my skepticism that any show could possibly top it. However, after seeing it twice now I would have to concede that Happily Ever After accomplished that seemingly impossible feat. I love the new music, which includes songs from several old & new Disney movies plus the original song, “Happily Ever After”, written for the show. The show’s soundtrack covers themes like Celebrating Friendship, Falling in Love, and Overcoming Adversity. 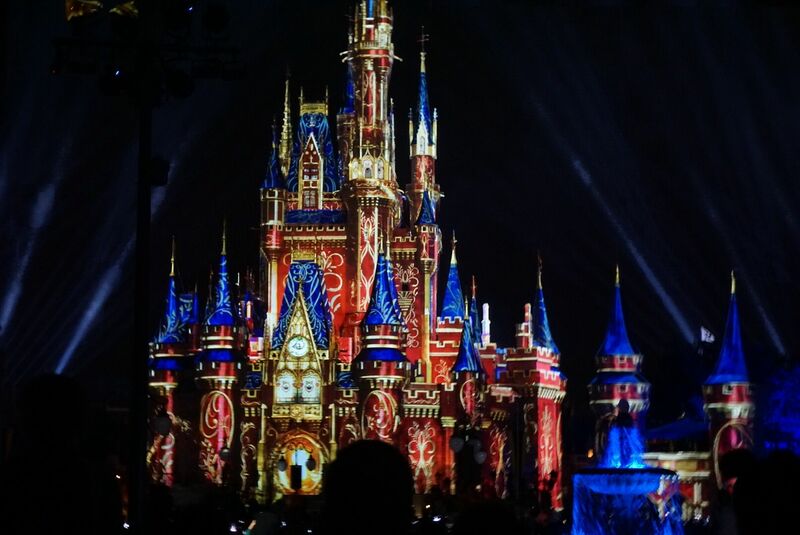 I also love the addition of the projection show on the castle. 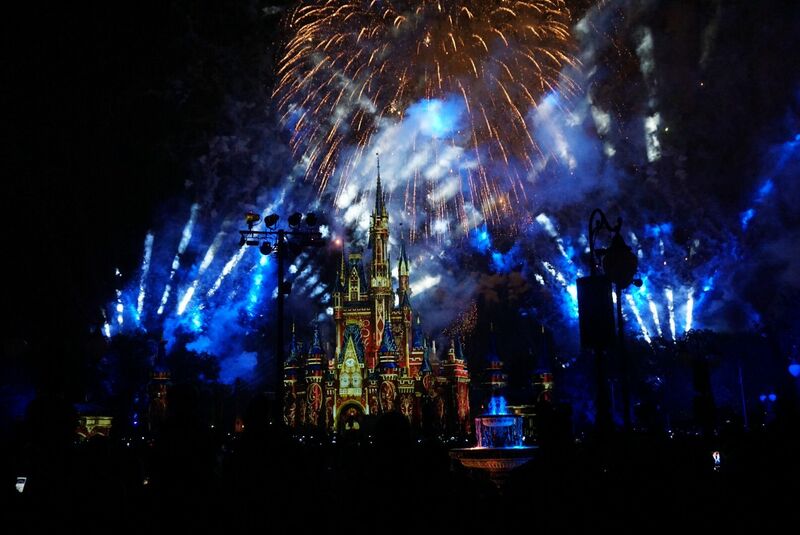 In my opinion, this makes watching the show in the park much more of a necessity than it was with Wishes. 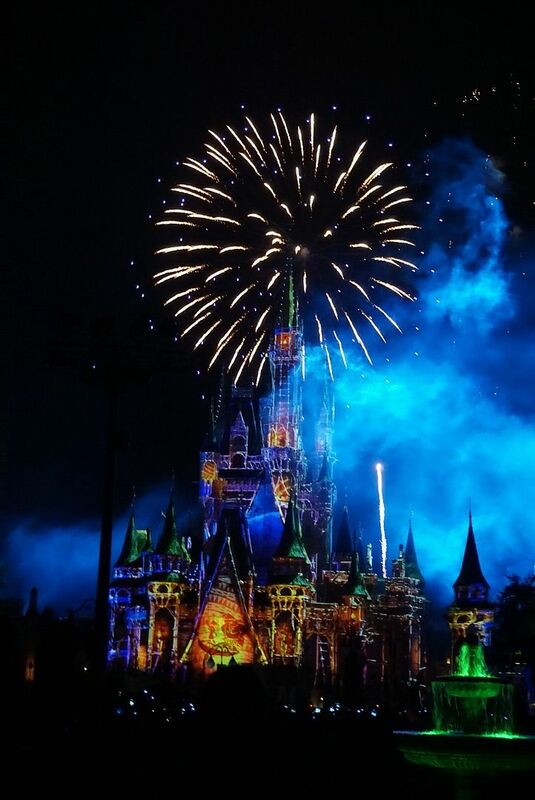 So in the end “Happily Ever After” makes me feel very happy…maybe not for “ever after” but at least for 18 minutes plus an hour or two afterwards. Stay tuned for Part II with my review of the dessert party.